Who does not know that? Especially in the cold season, you want to make a hot tea quickly. You turn on the kettle and wait for the water to boil. Or you would like to cook pasta for dinner and again you have to wait until the water finally cooks. Wouldn't it be nice if the boiling water came straight from your faucet? 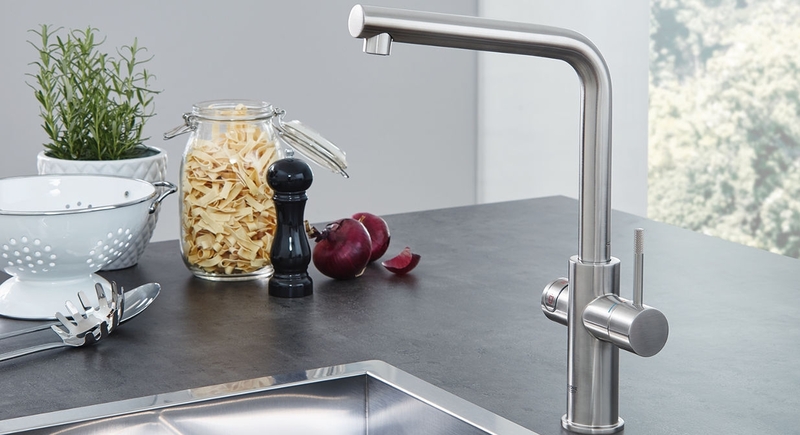 This will soon be possible in your kitchen too with the Grohe Red System. With a ceramic hob you wait about 7 minutes for the boiling water and even with an induction cooker it is still 4.2 minutes. With Grohe Red it takes exactly 0 minutes for the water to boil. Boiling water without waiting brings many benefits. For example, at cooking, cooking tea or rinsing. And since the kettle can be dispensed with, it also brings a significant energy savings and also saves space in the kitchen. Grohe Red is simply installed in the sink cabinet. The hot-water tank, which is available in the two sizes 3 liters (M-size, 34 cm high) and 5.5 liters (L-size, 49 cm high), has a diameter of only 21 cm. Another key advantage is that only as much water as needed is siphoned off and heated. Thus, in contrast to the stove or kettle also saved energy. The hot-water tank can be controlled with three switch levels: On, Off and Holiday. The Holiday Mode is a power-saving mode in which the water is only heated to 60° C.
For best taste ensures the additional water filter, which is connected to the Red water heater. In a five-stage filtering process, this filter removes taste impurities and limescale. This creates a pure taste and the device gets a longer lifetime. As a replacement filter, you can use the Grohe Blue filters. Especially when dealing with boiling water, the topic of safety is of course a central aspect. Grohe has developed a TÜV-certified child safety device for the Red System that is reliable and failsafe. In order to unlock the child safety lock, the button must be pressed for one second and then lights up red. Now press the lower activation button and keep it pressed. As soon as you release the button, the water flow stops. Additional security is provided by the water jet, which flows smoothly and without splashing out of the faucet, and the CoolTouch surface, which prevents you from burning yourself on the faucet. For easily fill a large pot and not have to press the activation button constantly, Grohe has also equipped the Red faucet with a potfiller function. This function is activated by pressing the child lock button twice. The LED ring lights up yellow and now the activation key can be pressed and the water runs for 60 seconds before it automatically stops. You can easily hold the pot with two hands. In this way, up to 3 liters of water can be siphoned off at once. After all the water has been tapped from the water tank, it takes about 15-20 minutes (M-size) and 20-30 minutes (L-size) to reach 100° C again. varied use: for blanching, cooking tea/coffee, rinsing, cooking, etc. The Grohe Red is a two-in-one fitting (duo version): on the left, the boiling water is handled, and, on the right, the normal tap water is siphoned off by means of a lever handle. The waterways in the fitting are also separated. So, you do not need an extra faucet to use the Red System. However, you can also keep your existing kitchen faucet and install the mono version. Here an additional faucet for the boiling water is mounted. Thus, the Red system can also be easily retrofitted, if you already have a perfect faucet. With the selectable designs of the spout (L-shaped or C-shaped), the faucet fits into any kitchen and also to any existing main fitting. For better usability, the spout can be swiveled by 150° and the handle for the normal water is oriented forward and equipped with a knurled structure for a better grip. The fittings are available with the surfaces chrome and stainless steel (longer delivery time). The boiler of Grohe Red is made of titanium, which makes it resistant to corrosion and limescale and gives no metallic taste to the water. In addition, the water tank is very well insulated, by which it requires little energy to keep the water on 100° C.
There are two options for installation: coldfill and hotfill installation. If your kitchen only has a cold-water connection, the coldfill installation can still produce warm water. But boiling water takes a little longer here. With the hotfill installation hot water is immediately available. In addition, a mixing valve ensures a constant mixture of hot and cold water and thus hot water instead of boiling water can be tapped, too. (Boiler and mixing valve are also available separately). The Grohe Red system can also be combined with the Blue system. For example in the combination Red Duo and Blue Mono or vice versa. Tip: Register your Grohe Red product now at Grohe.de and enjoy benefits: one-year extended warranty and welcome package with Grohe Red recipe book and Grohe Red thermos bottle with tea strainer.